(CNN) – Republicans on Sunday were reticent in voicing support for the National Rifle Association's scheme to place guards with firearms in American schools, though they also appeared to find little common ground with Democrats, who want tighter restrictions on purchasing assault weapons. Lawmakers from both parties have agreed that some changes are needed following the Newtown, Connecticut, shooting on December 14 that left 28 people dead, including 20 children. But while Democrats advocate new legislation making it harder to obtain military-style firearms, Republicans claim such measures have proved ineffective in the past. The NRA, the top lobbyist for gun manufacturers, asserted on Friday that armed guards in schools were the best prevention against a similar tragedy. That proposal, along with vows from Democrats to reintroduce bills banning assault weapons and high-volume ammunition clips, was met with skepticism Sunday from Sen. Lindsey Graham, a South Carolina Republican. "We had an armed guard in Columbine, we had an assault ban. Neither one of them worked," Graham said on NBC's "Meet the Press." "We're talking about preventing mass murder by nontraditional criminals, people who are not traditionally criminal, who are not wired right for some reason," he continued. "And I don't know if there's anything Lindsey Graham can do in the Senate to stop mass murder from somebody that's hell-bent on doing crazy things." Another Republican, Sen. John Barrasso of Wyoming, also cast doubt on the NRA's proposal, saying a national effort to place guards with guns in schools was misguided. "I think decisions about schools ought to be made at the local level," Barrasso said on "Fox News Sunday." "I would not want a national effort to say you have to do this in schools. I think local education decisions are best made at the local level." On CBS' "Face the Nation," GOP Sen.-designate Tim Scott said Americans shouldn't "rush to judgment" on the NRA's plan, but didn't offer an endorsement of the plan himself. And Rep. Jason Chaffetz, a conservative from Utah, said on NBC he was worried about arming educators since he "had science teachers in high school who can't negotiate a Bunsen burner for goodness sake." "I wouldn't suggest necessarily that we give everyone a gun. It's not for everybody," he continued. The NRA has specified it is not advocating teachers carry guns in school; rather, the group suggests schools could follow the example of malls and movie theaters that employ retired or off-duty policemen. Nearly every Republican appearing on the Sunday talk shows agreed that new gun restrictions were the wrong path to take in the aftermath of the Connecticut shooting - though some expressed an openness to hearing all options put forward. Republican Sen. Johnny Isakson of Georgia said he wanted President Barack Obama's newly formed team on gun violence to look into every aspect that could lead to a massacre like the one in Newtown, but that previous bans on assault weapons had done little to stop senseless killing. "Bans alone don't solve the problem," he said on ABC's "This Week," pointing to a prohibition on military-style weapons that was in effect in 1999 when the shooting at Columbine High School claimed the lives of 12 students and one teacher. Barrasso said Americans "can get false sense of security from Washington, and in passing more laws. But we need real solutions to a significant problem in our country, and I'm not sure passing another law in Washington is going to actually find a real solution." And Graham wondered how a ban preventing him from purchasing another AR-15 semi-automatic rifle would thwart another tragedy like the one in Newtown. "If you deny me the right to buy another one, have you made America safer?" he asked. Democrats say yes. Sen. Joe Lieberman, the retiring independent senator from Connecticut who caucuses with Democrats, said bans making it impossible to buy the type of weapon used in Newtown would reduce the chance of similar shootings in the future. While Republicans' intransigence on the issue means such a ban won't come easily, he said, the public is ready for new laws. "It's going to take the American people getting organized, agitated, and talking to their members of Congress," Lieberman said on CNN's "State of the Union." 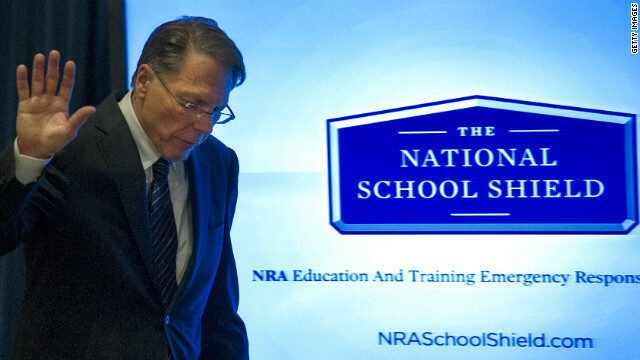 Following the tragedy in Newtown, Mr. Lapierre and the NRA put out a statement saying that they too were saddened and grieving because they also have sons and daughters. No, I believe if sons and daughters of members of the NRA were to be gunned down like these innocent kids in Newtown, perhaps then they would finally understand what it really means to be saddened and grieving. Please keep your phony sympathies to yourselves. also, the reason the NRA is sounding "defensive" is because they are blamed everytime there is a gun death–by contrast, Obama for allowing the violent half-lies of th USB movie to be put out with classified leaks possibly from the white house? are we not afraid of mideast "violence" due to this "despicable" video? "I'm all for getting these things out of the hands of criminals. I'm all for closing the loopholes. I'm all for proper training and education. But stop trying to punish the millions of for the acts of a few." We get it. You want to keep your guns. At the expense of the millions who also want to keep their guns and who might not be as responsible as you. Of course, we have no idea just how responsible a gun owner you are, do we? Just this past week a three year old child got hold of his parents gun and shot himself through the head. He'll never be given an opportunity to repeat that action again. I'd just as soon NO CHILD is given that opportunity. No doubt his parents thought they were responsible gun owners. As did Nancy Lanza. You see, I can mock as well as you do. Which is really all your comment was meant for. To mock. I have no idea why you are trying to rewrite youself as a gun owning victim. Nor do I care. Guns in America are a problem. As a gun owner, deal with it. The REALITY of gun ownership. Are people really listening to or reading the news every day? Almost every day the paper runs stories about people being shot in one state or another. Today we had more than 2 including firemen responding to a fire. Do we now need to arm our firemen, EMT's, utility workers, etc. The militia's in America were sometimes regulated. Some even had "drills" to prepare for an encounter with the British Redcoats. Once the revolution ended then states had their militias. Indeed households had rifles because they still hunted for food. Now, after all these years people still believe that they need guns to protect themselves from their own government. Isn't the ballot box the way to change the government. It just may be that people are not pleased by the outcome of an election so they decide they need to arm themselves. If gun control works so well in Europe, then why does Britain have over 2000 violent crimes per 100,000 people compared to 466 violent crimes per 100,000 in the United states? Does it really matter if you're assaulted, robbed, raped & killed by someone with a gun instread of a knife, shovel, club, or iron pipe? Crime stats provided courtesy of the 2012 European Commission. True, they have fewer isolated occurances of madmen going nuts with a gun, but it seems they have more people being victimized by criminals (4 times more)...who for some reason don't follow the establsihed laws. We don't need government to institute new gun laws or even to begin enforcing existing laws. What we need is for the insurance industry to do what they do best.... make money. Every home should be inventoried for firearms and ammo, security practices, and the number of household members, their ages and mental health status. Their premium should be based on the level of risk presented. If you have 5 high capacity firearms and clips, an adolescent with a record of crimes or violence, and no locked gun safe, then you will have to pay an alarmingly high premium for insurance based on the probable risk that one of the firearms could be used in a shooting. Lie about anything and you'll lose everything... everything you own or will ever have. Do what the Republicans say works... leave it to the private sector, not government. The National Rifle Association is the the chief Lobbyist for Gun Manufacturers That owuld be the National Shooting Sports Foundation.. Your highly biased largely anti gun coverage of this issue has cost you another viewer and reader. It is very unfortuante how tawdry and slimey CNN has become. Sad to see you are living down to your reputation, especially with that insipid spineless cur Piers Morgan spouting his emasculated viewpoint. If gun control works so well in Europe, then why does Britain have over 2000 violent crimes per 100,000 people compared to 466 violent crimes per 100,000 in the United states?" Fuzzy logic at its finest. I would rather have a bump on my head than have a hole through it. Nothing like a good old fashioned fist fight ...remember those? Now it's push comes to shove replaced by push comes to shot. Your argument lacks any merit or reasoning. Mama said: "stupid is as stupid does."... Mama-Gump didn't own or need a gun. American tax payers would gladly pick up the bill for a school shield funding, that is as soon as the GOP pick up the $5.2 trillion for their Afghan and Iraq wars. Mr. LaPierre and his Republican accomplices have no interest in how many children are crippled, murdered or orphaned by violence; other than how it affects their cult of gun worship. If there is less violence during a year, well, guns are the reason and we should have more of them. If there is more violence, well, we need more guns to stem the rising tide of death and destruction. These fanatics have abandoned any attempt at appearing reasonable or rational or sane. We must have more guns, bigger guns, guns for every purpose. Guns will protect us. Guns will be our safety and our salvation in time of need. Unto guns we lift up our voices in praise. It is all about gun sales. Fear increases sales. The NRA loves this stuff. There are 18 armed security guards at the school that Obama's children attend. So, liberals are saying armed guards at schools is foolish - apparently not for their president! Don't lose sight of the fact that gun legislation would not affect anyone's right to own rifles, pistols or shotguns. Just assault type rifles and large capacity magazines. So, really, it should have little concern to the vast, vast majority of gun owners. Maybe just some fringe enthusiasts. And, a few really crazed souls. The U.S.A. is one of a few countries left in the world where a person can plead self defense. The down side is that there will be some collateral damage. Americans can forfeit self defense and reduce collateral damage like Canada or most European countries, for example. It is a trade off that Americans will have to decide on. Make sure you consider all the pros and cons carefully before you make your choice. In Canada, citizens have traded liberty to self defense for government protection. So people who plead self defense are severely prosecuted to make an example of them in order to discourage others from doing the same thing. In the process, criminals end up having more rights than victims. Canada and many other countries have decided that reduced collateral damage trumps freedom of self defense. "Bans alone don't solve the problem." So the answer to having too many guns in the street is to put more guns in the street? Makes perfect sense. Why not build a machine gun nest near the door of every school, and maybe have a few snipers on the roof. A couple of claymores in the hallways, and I think our kids would be safe. Yup......that's the way to go. I find it extremely ironic that the party that worries about a police state and espouses everyone to hold onto their guns becaus the "lefties" in this country want to create a police state would ask for POLICE in a school–isn't that the beginning of a police state????? @truth of the matter.......Obama's children receive extra protection because of the threat level to any member of the first family, as they should. Before he became president, do you think his kids had 18 armed guards around them? Get real man......you're making a false argument. The NRA is more like the Catholic Church , 200 years behind the times ! "So, liberals are saying armed guards at schools is foolish – apparently not for their president!" No. We are questioning why the NRA is suggesting armed guards at schools only. Children travel to shopping malls, to theaters, to businesses while visiting parents, to parks, to - well, almost everywhere there is a street corner in America there is a child. This president's children (ALL presidents children – not just the Obama family) were / are protected 24/7 ... why then are not ALL children given that same protection?